There are many recipes for cornbread, but this is my standard. It's adapted from a recipe that appears in Farmhouse Cookbook by Susan Herrmann Loomis. 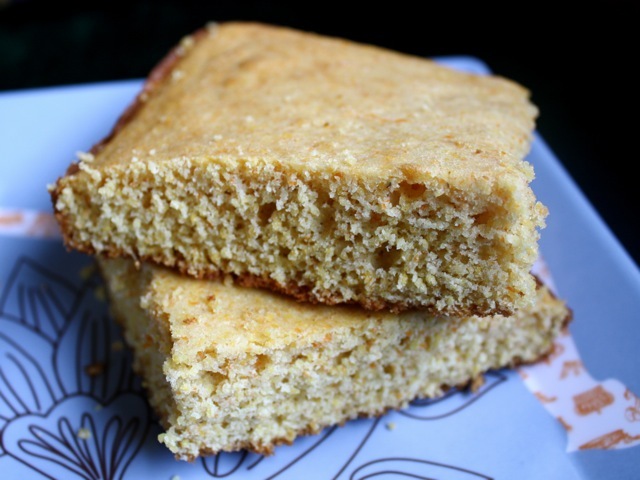 The basic recipe is definitely sweet, which is the way I like my cornbread, so use the savory option (less sugar as indicated below) if you prefer your cornbread without the sweetness. Preheat oven to 400 degrees. Butter an 8-inch-square baking dish. In a small bowl, whisk together cornmeal, flour, baking soda, and salt. In a medium bowl, mix together the egg, brown sugar, and buttermilk. Add the dry ingredients to the egg mixture and stir to combine. Stir in melted butter. Pour batter into prepared baking dish. Bake on the middle rack of the oven for 15 to 20 minutes, or until golden-brown. Cool in pan for 10 minutes before cutting into squares to serve. Delicious served warm with honey and butter. Substitutions: You can use blue cornmeal instead of yellow. The corn flavor will not be quite as strong. Variations: Stir in one 4-oz. can chopped green chiles, or 1/2 cup grated cheese, or 1/4 cup chopped fresh cilantro.